Xiao-Li Meng, Dean of the Harvard University Graduate School of Arts and Sciences (GSAS), Whipple V. N. Jones Professor and former chair of Statistics at Harvard, is well known for his depth and breadth in research, his innovation and passion in pedagogy, and his vision and effectiveness in administration, as well as for his engaging and entertaining style as a speaker and writer. Meng has received numerous awards and honors for the more than 150 publications he has authored in at least a dozen theoretical and methodological areas, as well as in areas of pedagogy and professional development; he has delivered more than 400 research presentations and public speeches on these topics, and he is the author of "The XL-Files", a regularly appearing column in the IMS (Institute of Mathematical Statistics) Bulletin. His interests range from the theoretical foundations of statistical inferences (e.g., the interplay among Bayesian, frequentist, and fiducial perspectives; quantify ignorance via invariance principles; multi-phase and multi-resolution inferences) to statistical methods and computation (e.g., posterior predictive p-value; EM algorithm; Markov chain Monte Carlo; bridge and path sampling) to applications in natural, social, and medical sciences and engineering (e.g., complex statistical modeling in astronomy and astrophysics, assessing disparity in mental health services, and quantifying statistical information in genetic studies). 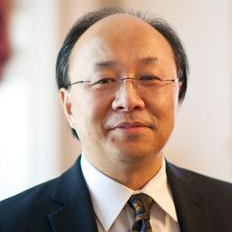 Meng received his BS in mathematics from Fudan University in 1982 and his PhD in statistics from Harvard in 1990. He was on the faculty of the University of Chicago from 1991 to 2001 before returning to Harvard as Professor of Statistics, where he was appointed department chair in 2004 and the Whipple V. N. Jones Professor in 2007. He was appointed GSAS Dean on August 15, 2012.